Good Night, And, Good Luck takes place during the early days of broadcast journalism in 1950's America. It chronicles the real-life conflict between television newsman Edward R. Murrow and Senator Joseph McCarthy and the House Un-American Activities Committee. With a desire to report the facts and enlighten the public, Murrow, and his dedicated staff - headed by his producer Fred Friendly and Joe Wershba in the CBS newsroom - defy corporate and sponsorship pressures to examine the lies and scaremongering tactics perpetrated by McCarthy during his communist 'witch-hunts'. A very public feud develops when the Senator responds by accusing the anchor of being a communist. In this climate of fear and reprisal, the CBS crew carries on and their tenacity will prove historic and monumental. $421.466 thousand on 11 screens. 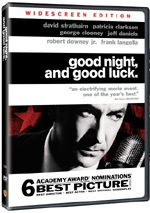 Of the five 2005 nominees for Best Picture, Good Night, and Good Luck looked like the one that would most appeal to me. I love learning about 20th century history, and the issues surrounding the Communist “witch hunts” of the late Forties and early Fifties intrigue me. That meant Luck sounded like a winner. Unfortunately, the end result was much less interesting than I anticipated. Set in 1953-1954, Luck follows the reporting of CBS TV newsman Edward R. Murrow (David Strathairn). He initially begins to go after the anti-Communist campaign when the Air Force boots out a reservist named Milo Radulovich due to suspected ties to the reds. No one produces any actual evidence, so Murrow runs a story on the military’s irrational reasoning and the negative effects of Senator Joseph McCarthy’s hearings. From there Murrow takes after McCarthy in a more active manner. He does so despite risks to himself and others, a factor spotlighted by the worries of fellow newsman Don Hollenbeck (Ray Wise), an alleged “pinko”. 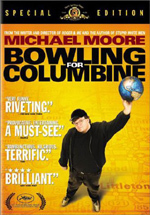 The movie follows Murrow’s efforts and their results. And what are those results? Not much, if we follow the film’s conclusions. We learn of McCarthy’s eventual censure in the Senate but Murrow, et al, cynically note that this probably won’t mean much in the greater scheme of things. The flick conveys a strange “can’t win – why bother?” attitude. That provokes the question: why bother to make a movie about a noted newsman’s risky crusade if it doesn’t mean much anyway? Oddly, although Murrow’s work clearly helped prod the public backlash against McCarthy, you don’t get that feeling here. Luck fails to connect the dots with any clarity. Events happen but don’t seem to reflect the actions onscreen. There’s an almost haphazard feel to the way that the chronology proceeds, and it comes across with no urgency or drama. I find that to be arguably the film’s biggest flaw. It’s so dispassionate that it becomes inert. I applaud the fact that director George Clooney chose to make a restrained flick without the usual showiness and hoopla, but I think he went too far in the opposite direction. Luck is overly respectful of its subject, as it lacks the heat to create an intriguing story. It keeps us at an off-putting distance and never gets involved in a significant way. Rarely does the movie really give us the feel of the era’s atmosphere. The fear of Communism was real and pervasive, but Luck makes it look like little more than the fantasies of a sadistic senator. Whether or not any true Communist threat existed, the “Red-hunt” had terrible ramifications for many lives. Luck briefly alludes to that but fails to deliver any substantial impact in that regard. The Hollenback character appears for little reason other than to try to add some of that emotional element. He acts as the representative of all those whose lives were ruined by the antics of McCarthy and his ilk. Unfortunately, the movie doesn’t pack a punch when it looks at Hollenbeck. It never offers a clear look at why Hollenbeck felt the situation was so dire – CBS never fires him and he never goes before the feds – so his suicide appears just as a cheap heart-tugging gimmick. Yes, we get allusions of other personal problems that push Hollenbeck over the edge, but the film fails to explore these in a manner rich enough to add power to what happens. When I look at Luck, comparisons with two other films come to mind. 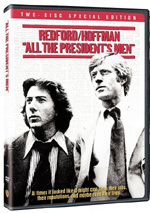 Clooney clearly saw 1976’s All the President’s Men as an inspiration, as both movies handle their historical events in similar ways. When I watched Men, I applauded its choice to focus on the news story at hand and not to give us the usual banal material about the characters’ lives outside of that scope. So why does the same decision in Luck seem so sterile? Because the folks behind Men managed to bring passion to the piece. We found a sense of inner life within the characters that doesn’t appear here along with a real threat. Never do either of those elements inform Luck; it mimics the style of Men but not the drama. I also couldn’t help but think of 2005’s Capote while I watched Luck. Both films focus on specific events in the lives of important men, and both take place in roughly the same time period. Both also treat matters in a dispassionate manner. They diverge when we look at their main characters. As Capote, Philip Seymour Hoffman delivered a strong performance in which he brought out the role’s inner life in small, subtle ways. Strathairn never manages to make his Murrow seem like much more than an impersonation. He gets the mannerisms and delivery down pat, but we don’t see Murrow as much more than a stiff cutout. I respect and like Strathairn, and I don’t blame him for the role’s shortcomings. 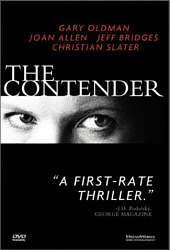 The flaws come from the script, as the text gives Strathairn nowhere to go in the part. It treats Murrow as hero and patriot with no room for human flaws or other interpretations. Hoffman was allowed to room to deliver a three-dimensional performance as Capote, and the story encouraged that. Luck prefers to view Murrow in a narrow manner and doesn’t give the actor any space to open up the part. That’s one main problem with the film: its simplicity. It depicts basic good vs. evil without any life or depth. Good Night, and Good Luck focuses on one side of its story in a stiff, buttoned down manner and doesn’t manage to bring any energy to the story. There’s clearly a vivid tale to tell but the movie lacks passion or drama. Good Night, and Good Luck appears in an aspect ratio of approximately 1.85:1 on this single-sided, double-layered DVD; the image has been enhanced for 16X9 televisions. Not too many problems marred this transfer. Sharpness was usually solid. A smidgen of softness crept into some wider shots, and I noticed a little edge enhancement as well. Both issues remained minor, however, as the movie mostly appeared distinctive and concise. No concerns with shimmering or jagged edges occurred, and I noticed no signs of source defects. The movie’s black and white cinematography looked great. Contrast seemed strong, with a nicely differentiated tone to the image. Blacks consistently looked rich and dense, while low-light shots were appropriately visible and well developed. This was a very good transfer that just narrowly dropped below “A”-level standards. Given the movie’s quiet focus, I expected subdued audio. That’s exactly what the exceedingly low-key Dolby Digital 5.1 soundtrack of Good Night, and Good Luck delivered. Much of the film barely spread beyond the boundaries of monaural sound. The few pieces of music showed very slight stereo imaging, and some newsroom environmental elements also popped up in the side channels. The surrounds may have added general reinforcement, but I never noticed any sound from the rear. Audio quality was good. Speech was consistently natural and crisp, with no signs of edginess or other problems. Music seemed clear and well rendered. The songs never exactly blasted out of the speakers, and the mix delivered them with the appropriate vivacity. Effects played such a small role that they were almost non-existent. They stayed in the background and remained accurate. This was a simple track that suited the material. A couple of extras appear as well. The primary attraction comes from an audio commentary with director/actor/screenwriter George Clooney and producer/actor/screenwriter Grant Heslov. Both sit together for this running, screen-specific discussion. They touch on their interest in the subject and research, facts and liberties, cast and performances, set design, cinematography and visual concerns, influences and inspirations, and various production issues. Only one real problem emerges during this track: dead air. Clooney and Heslov fall silent a little too often. When they speak, they offer pretty good information. We get a nice feel for their motives and decisions, and the long-time friends interact well. They bring a very nice dry humor to the package too, especially when “former Sexiest Man Alive” Clooney pokes fun at himself. Despite the gaps, this is an interesting and informative piece. The Good Night, and Good Luck Companion Piece offers a 15-minute featurette. It includes remarks from Clooney, Heslov, actor David Strathairn, and many unnamed parties who appear to include the real Milo Radulovich and Joe and Shirley Wershba, and a son of Fred Friendly. They discuss the facts behind the project, various issues related to it, and reflections on Murrow and his era. This offers a reasonably intelligent and introspective piece, and the presence of some real participants – albeit unnamed – makes it more useful than it otherwise might be. It doesn’t dig into anything particularly well, but it’s a good overview. In addition to the film’s trailer, the DVD opens with some Previews. We find ads for Everything Is Illuminated and Paradise Now. I looked forward to Good Night, and Good Luck. I wanted to like it and based on my interest in the subject matter, I expected to like it. Unfortunately, the movie came as a crashing disappointment. It failed to connect to the drama inherent in the story and came across as a flat, uninvolving piece. The DVD offered very good picture along with acceptable audio and decent extras highlighted by a solid audio commentary. My disappointment with Luck makes it tough for me to recommend it, though it might merit a rental for those interested in the topic.